On monday a study by the Convention on Biological Diversity in collaboration with the UNEP World Conservation Monitoring Centre was released (->press release). The study with the title “Scientific Synthesis of the Impacts of Ocean Acidification on Marine Biodiversity” is a survey on the current results in the investigation of ocean acidity. It is thus a follow-up study to studies initiated e.g. by the global network of science academies (see IAP statement on ocean acidification ) or like the ones which led to the Monaco Declaration. accumulation of CO2 in the atmosphere may accelerate rather soon. A second main message/problem with this uptake of CO2 is ocean acidification. If CO2 reacts with water this gives carbonic acid , which dissolves mostly to HCO3- and hydrogen ions H+. Thus after CO2 has been taken up by the ocean waters it will give to a smaller amount carbonic acid H2CO3 and carbonate ions CO3^2- and for the most part bicarbonite ions HCO3-. The hydrogen ions decrease the PH level – (you may sometimes find information of PH levels on your liquid soap) that is – the PH gives an indication of the concentration of hydrogen ions H+ via the concentration of Hydronium and it is thus a measure of the acidity or basicity of a solution. Furthermore the carbonate ions CO3^2- form together with H+ again bicarbonate HCO3-. A higher concentration of H+ (“the acidity”) thus decreases the availablity of carbonate. But carbonate is necessary for producing calcium carbonate (CaCO3) which is essential for shell formation in marines organisms such as corals, shellfish and marine plankton. In other words the increasing acidification of the oceans is harmful to a lot of marine creatures. Since this process is very fast and the fast increasing acidification is clearly measurable this will lead to a rapid change in the composition of the oceans with more or less forseeable consequences. In particular it is very likely that this will have an impact on fish consumption. It seems an enzym called V-type H+ ATPase is responsible for the proton pumping. While the protons are pushed out, there is an “inside” location in the forminifer (the socalled site of calcification (SOC)) which is less acidic and so shell formation can take place. For this the CO2 is “sucked into the foraminifer”, i.e. : “As CO2 diffuses easily across cell membranes compared to HCO3−, the large pCO2 gradient results in a flux of carbon dioxide into the foraminifer.” And so shell formation can take place at the SOC via the in the blogpost described process. The foreseen reduction in pH (from 8.1 today to ∼7.8 at the end of the twenty-first century36) by increased oceanic CO2 uptake is relatively small compared with the pH decrease in the foraminiferal microenvironment (down to 6.9 in Fig. 1) during calcification. Hence, a relatively moderate decrease in pH may not impair foraminiferal calcification, especially as DIC increases at the same time. 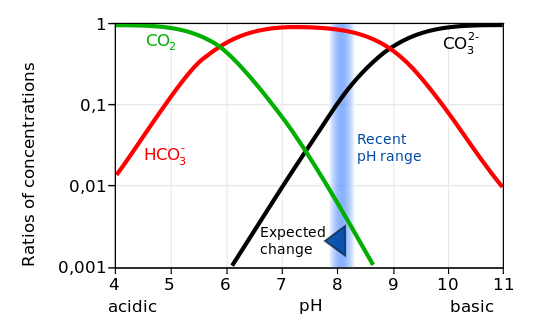 Ocean acidification may still affect calcification indirectly (for example, through altered metabolism). where DIC is “dissolved inorganic carbon” i.e. all those bi,di, etc. carbonates. …total dissolved CO2 may not reduce calcification, thereby potentially maintaining the current global marine carbonate production. Results from culturing experiments mimicking ocean acidification showed contrasting responses of calcification: calcification was reduced in some species, whereas others were not affected. Moreover the proton pumping mechanism may not work if acidification levels lower beyond 6.9. Hand care is very important. “The antiaging movement has picked up a lot of steam and people are starting to focus on parts of their body other than their faces,” said Dr. David Colbert, a Manhattan dermatologist who has worked on the hands of, among others, Dara Tomanovich, the face (and hands) of the Olay Regenerist skin care line.